When it comes to baking without gluten, gluten-free baking powder is not a given. Most of the time. But not always. What's In Your Baking Powder? Sodium bicarbonate: commonly known as baking soda. Acid salts: these combine with the sodium bicarbonate and water to produce carbon dioxide, releasing bubbles in the cookie dough and allowing it to expand. Starches (moisture-absorbing agent): these keep the baking powder mixture dry and add bulk so you can measure the powder accurately. 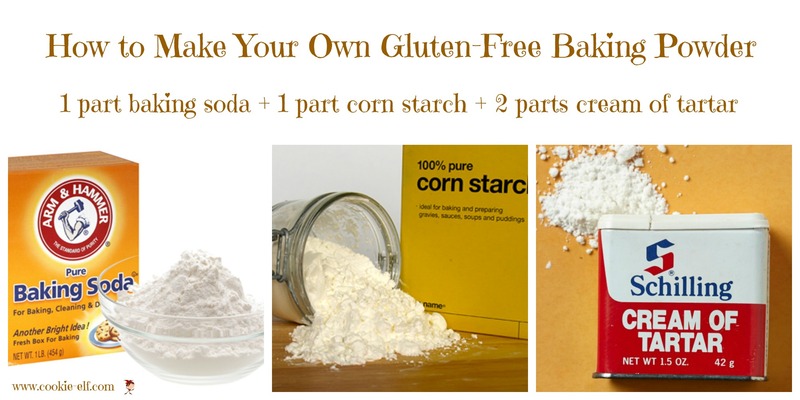 The first two ingredients – sodium bicarbonate and acid salts – are gluten-free. As for the starch element, most baking powders contain cornstarch (gluten-free) or potato starch (gluten-free), making those products gluten-free. But a few brands use wheat starch as their moisture-absorption agent. That throws a wrench into the gluten-free universe. According to manufacturer information, the following baking powder brands are gluten-free. Most of these products are available at large and small grocery stores throughout North America. If you are unable to find baking powder that is gluten-free or you find that the can you have is old (passed expiration date, making it less potent as a leavening agent), you can make your own. Place ingredients together in a small dish. Combine thoroughly with a spoon. Use immediately. Keep in mind that this baking powder is single acting, meaning its leavening action begins as soon as the baking powder comes into contact with moisture. Double-acting baking powder rises more when it is exposed to heat in the oven.